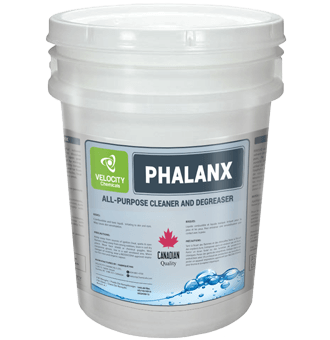 A water-based general purpose cleaner and degreaser, PHALANX is CFIA approved making it ideal for the cleaning of dairy and food processing areas, milking parlour and barn walls and floors, farm equipment, sidewalks and walkways. Its innovative formula provides accelerated action in penetrating and dissolving grease and oil, ensuring the highest quality clean. Mixed with water, PHALANX can quickly remove common soils from milking parlour equipment, walls and floors, including solidified fats, denatured proteins, deposits of milk lactose and hardened minerals. The result is to attain a higher standard of hygiene that not only protects milking systems but promotes the production of high quality milk. If you’d like to learn more about PHALANX, you can download a copy of our latest brochure. Achieves and maintains higher level of cleanliness in milking systems. Contributes to the production of safer and higher quality milk. Cleans milking parlour walls and floors, barns, walkways, tractors and other types of farm equipment thoroughly. Formulated to remove grease, milkstone, oil, and other bacteria-laden soils quickly & efficiently. CFIA-approved, making it ideal for use in all food processing areas. PHALANX is now available directly from Velocity Chemicals, with orders shipped to anywhere in BC within 24 hours. To order, call one of our specialists today at toll-free 1-888-963-9499.